New & Notable: What to do with an eye-rolling juror? Most trial lawyers occasionally, but inevitably, encounter a juror who demonstrates through the raising of an eyebrow or the roll of the eyes what he or she is thinking about a piece of evidence or a position taken in court. Like most murder cases, Jonathan Cioppa was being tried before a judge and jury but on Mr. Cioppa’s jury was a particularly opinionated and, even more importantly, demonstrative juror. Just before the judge’s final instructions to the jury, the defence brought an application for an inquiry to be held under section 644 of the Criminal Code regarding whether the demonstrative juror should be discharged. Nordheimer J. declined to conduct an inquiry and dismissed the application: R v Cioppa, 2012 ONSC 6832. Juries are a fundamental part of our criminal justice system. 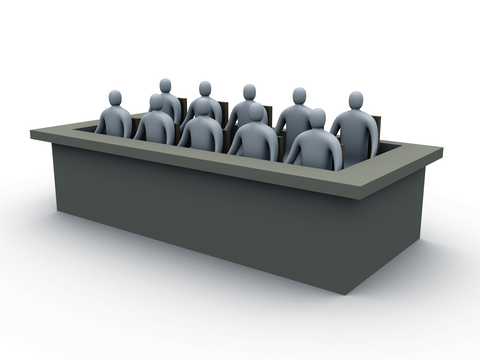 Trial judges and appellate courts should treat lightly, it at all, when they purport to speculate about the possible impact errors or omissions may have had upon a jury. In the recent case of R v Sahota, 2011 ONCA 679 the Court of Appeal refused to engage in such speculation. Jaswinder Sahota was charged with offences relating to the discovery of heroine in a suitcase he possessed as he entered into Canada. He was tried before a jury. During deliberations the jury had a question; they asked if they could have transcripts of counsel's closing addresses. The trial judge, with the agreement of both counsel, advised they jury they could not and should rely upon their collective memories. The next morning the Crown brought to the attention of the trial judge cases which suggested the jury should have been told they could have listened to the closing addresses of counsel. Despite an objection by defence the trial judge intended to advise the jury of this option. The jury, however, advised it had come to a decision. The trial judge brought in the jury and advised them that they had the option to listen to the closing addresses before delivering their decision. After considering this the jury indicated it was still prepared to deliver its decision and it did, finding Sahota guilty. The trial judge made it clear that the jury could listen to the closing addresses before reaching their verdict. They saw no need to do so. We will not speculate as to why they chose that course of action. In the end, before the jury returned its verdict, the jury understood that it could listen to the addresses if it wished to do so. The trial judge ultimately answered the jury’s request correctly. The timing of his answer did not result in any unfairness to the appellant [para 9]. Antonio Jones was a drug dealer. Scott Larriviere was a client and owed Jones some money. On 18 September 2004 the two met. Larriviere was to pay Jones the money owed and then drive him to some other customers in exchange for some more drugs. Things did not go as planned. While sitting in Larriviere's truck Jones struck Larriviere in the head with a metal bar. Larriviere suffered irreversible brain damage and ultimately died after spending a year in hospital. Jones was charged with second-degree murder. He was convicted of manslaughter after a jury trial. He appealed. The appeal was dismissed: R v Jones, 2011 ONCA 584. On appeal the apppellant raised two grounds of appeal. First, the appellant alleged that the trial judge erred by failing to correct a misstatement by the Crown (which was then amplified by the trial judge) about when or where two photographs of the truck were taken - the photographs were relevant to a claim of self-defence which was obviously rejected. Second, the appellant alleged the trial judge erred by not insisting the jury hear the answer to their question about when the photos were taken - the jury returned their verdict without hearing the answer. With resepct to the first ground of appeal, Laskin JA, for the court, first considered if in fact there was a misstatement. After reviewing the comments of the Crown and judge, Laskin JA accepted that the comments of the Crown could have been misleading and that this might have been reinforced by the trial judge [paras 26-37]. Despite this, Laskin JA held that the initial misstatement, "at its highest" was "quite modest" [para 40]. In doing so Laskin JA noted that a trial judge is not required to correct every misstatement of fact by counsel. Moreover, he pointed out that no objection was made by counsel at the time and the trial judge instructed the jury that it is their collective memories which form the basis of their deliberations not counsel's submissions. Finally, Laskin JA noted that the jury apparently appreciated this misstatement as they asked for clarification. With respect to the second ground or appeal, Laskin JA noted the jury question as follows: "Could you please confirm that exhibits/photographs 10(a) and 24 were taken at the crime scene?" [para 47]. The photographs in question include a photograph which showed an open ashtray with ashes in it (no ashes were strewn about the interior - offering evidence to rebut the self-defence claim) and the other photograph was a picture that showed a pair of scissors sitting precariously on the dash. Okay. Thank you. Have a seat. Thank you, members of the jury. We understand you have reached a verdict. By that e also understand that you no longer needed the answer to the question that you had sent us. We were prepared with an answer just as we were getting your note. If we are wrong in that assumption, you should advise us. If you want some time to think about that, you may step outside and think about it. If we are not wrong in that assumption that you no longer needed the answer to the question in order to reach your verdict, then the foreperson should give the verdict to the CSO. Okay. Poll the jury. Okay. The Registrar will poll you now [para 52]. Indeed, I find it hard to see what the trial judge did wrong. She gave counsel an opportunity to consider what to do. She proceeded in the manner she did with their agreement. She gave the jury an opportunity to have its question answered before delivering its verdict. And, although the jury did not explicitly advise the trial judge it no longer needed its question answered – as the jury in Sit did – it did so implicitly by giving its verdict [para 56]. Laskin JA went on to expressly agree with the Crown’s submission that “It would not have been appropriate for the trial judge to question why the jury no longer wanted its question answered or to require the jury members to hear an answer when they had indicated that it was not needed” [para 57].